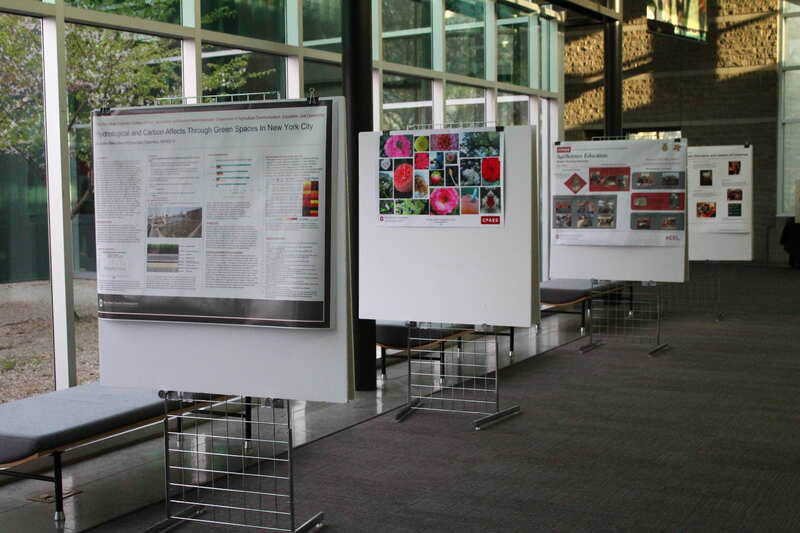 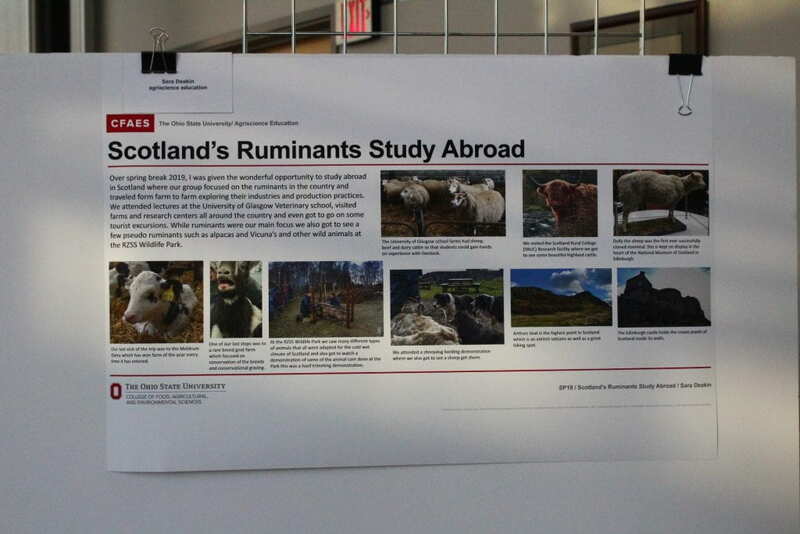 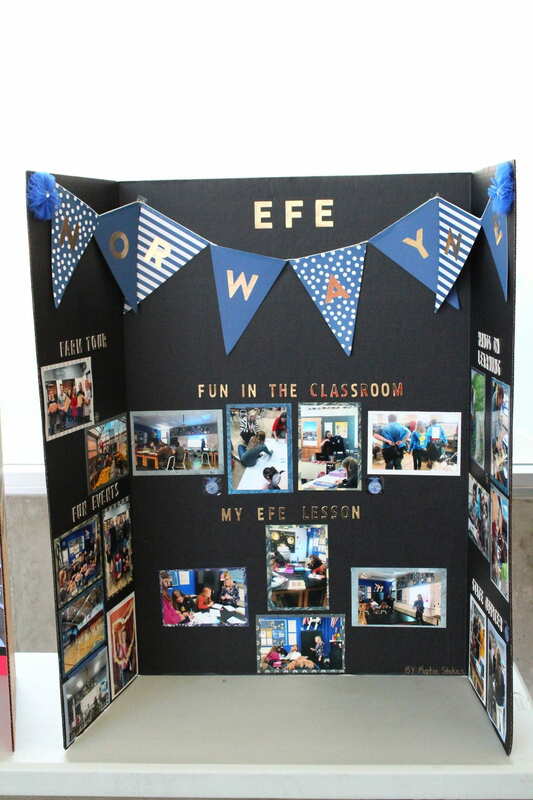 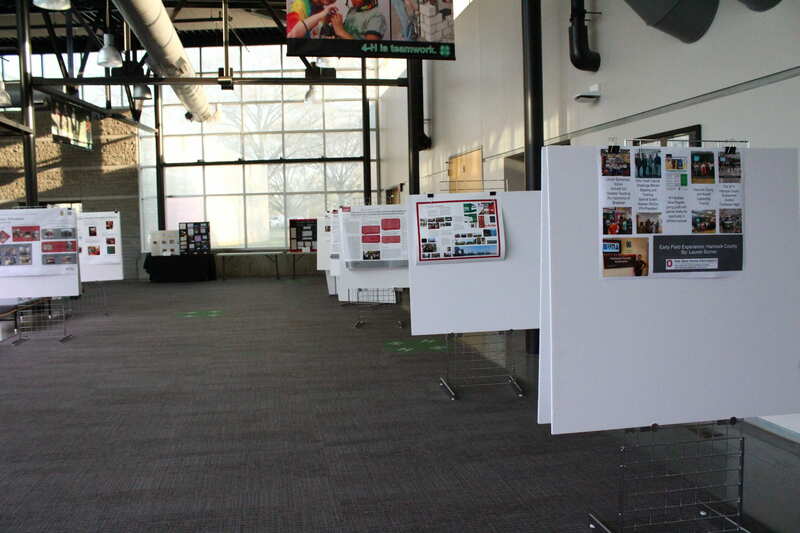 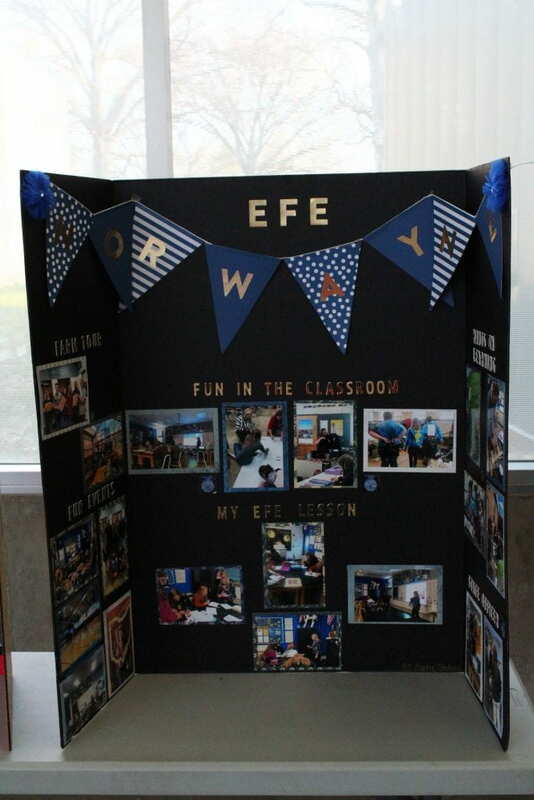 At our annual department banquet this year, we added a new student showcase feature where our undergraduate and graduate students were invited to display posters of their internship, study abroad and field experiences, research, class projects and student organization activities. Thank you to our students at both the Columbus and ATI campuses who made this first year a success. 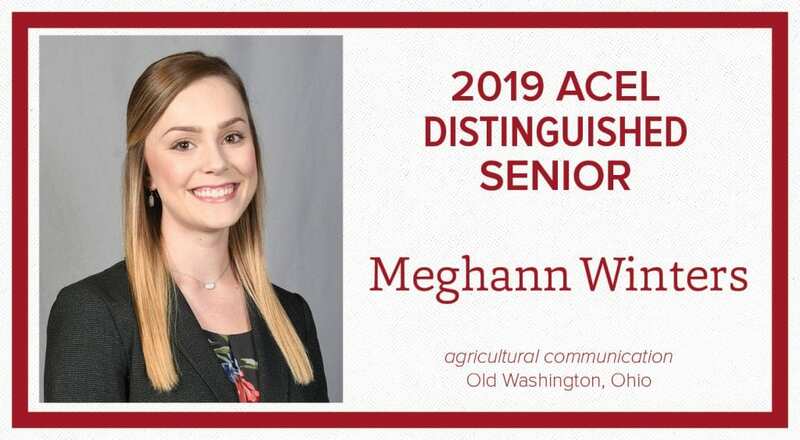 At the 2019 Department of Agricultural Communication, Education, and Leadership Banquet, one graduate student and 10 seniors were named as Distinguished Students. 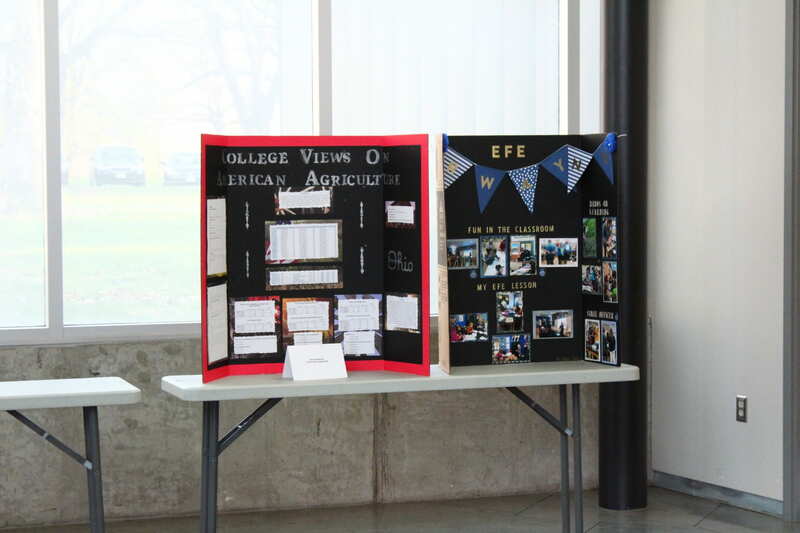 Congratulations to these students on their academic success and best wishes in their future endeavors! 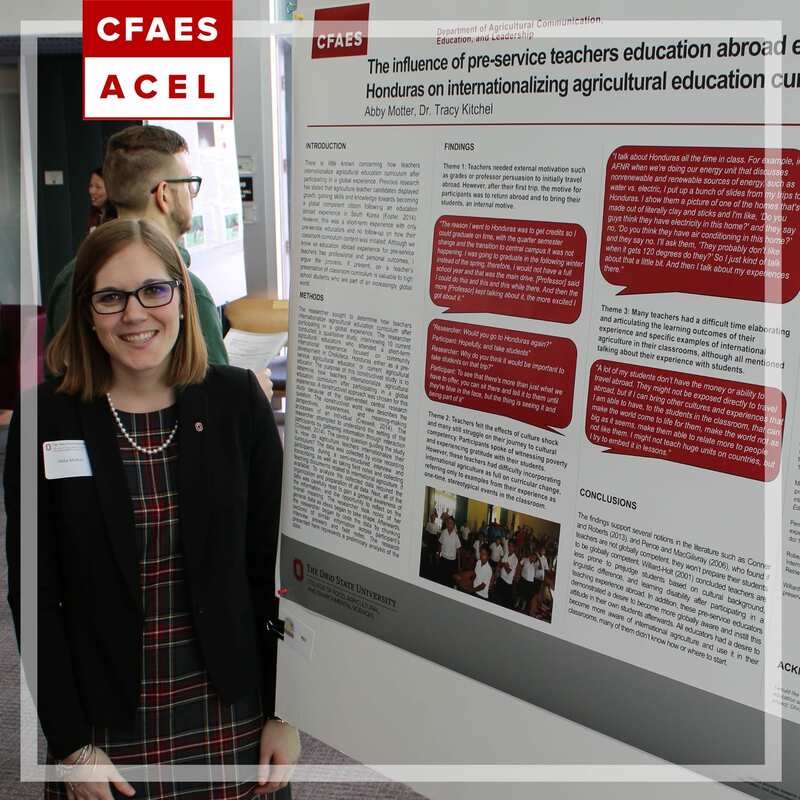 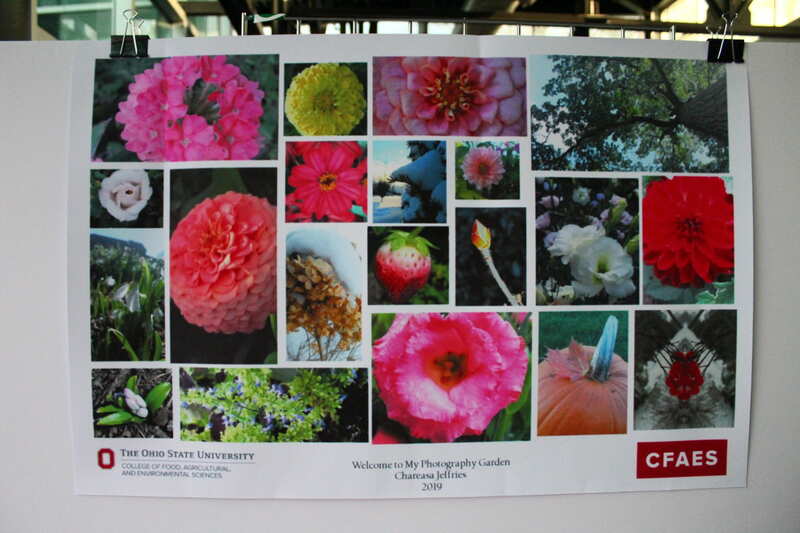 Students in the Department of Agricultural Communication, Education, and Leadership were recognized at the annual CFAES Celebration of Students Recognition Program on April 4, 2019. 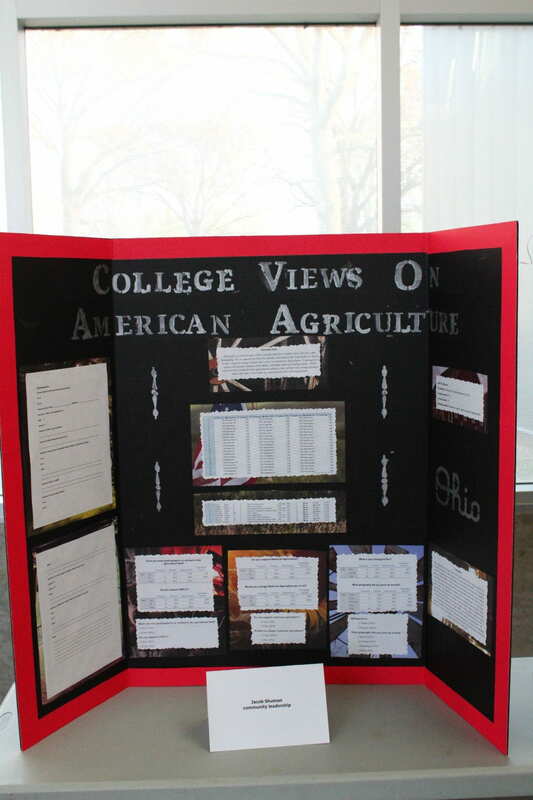 Held in the Archie Griffin Ballroom at the Ohio Union, students and student organizations in ACEL were recognized for their academic achievements and community engagement. 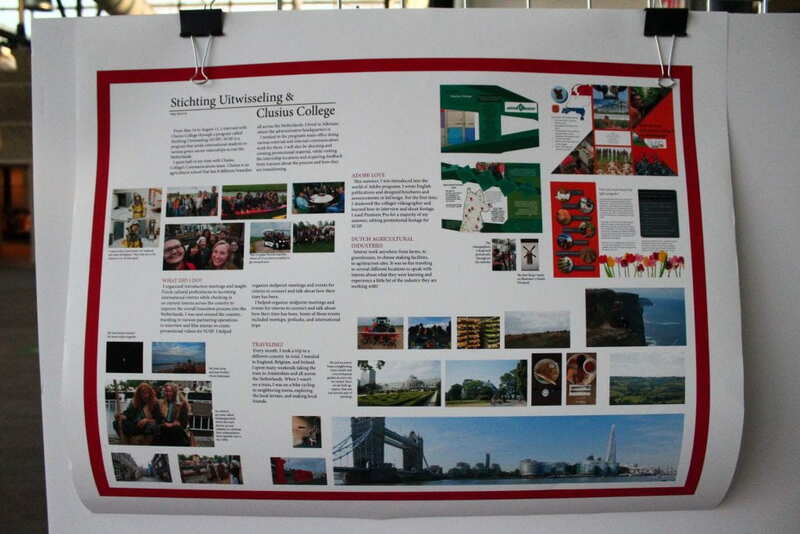 Congratulations to our students on a fantastic year! 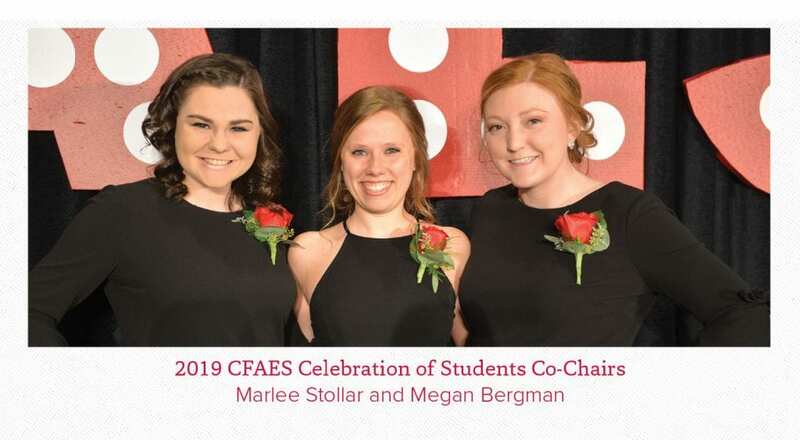 Marlee Stollar, a junior studying agricultural communication (left), and Megan Bergman, a junior studying agriscience education, served as two of the three student co-chairs of the recognition program. 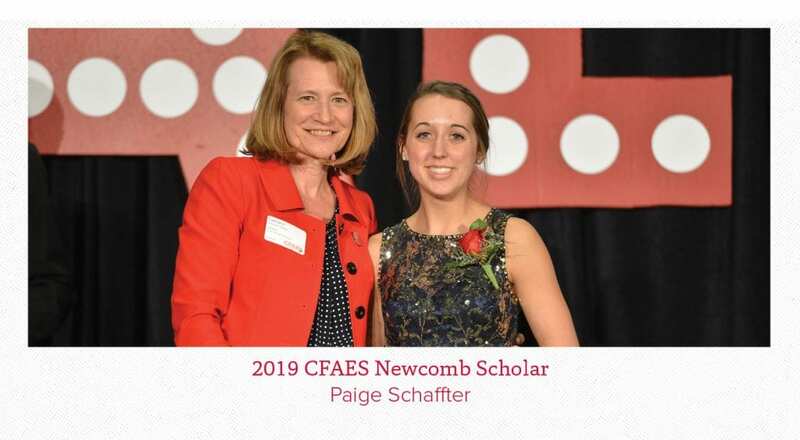 Paige Schaffter, a sophomore studying agriscience education at Ohio State ATI, and Sarah Longo, a senior studying community leadership, were recognized as Newcomb Scholars. This award is presented to the top four students for each rank in CFAES. 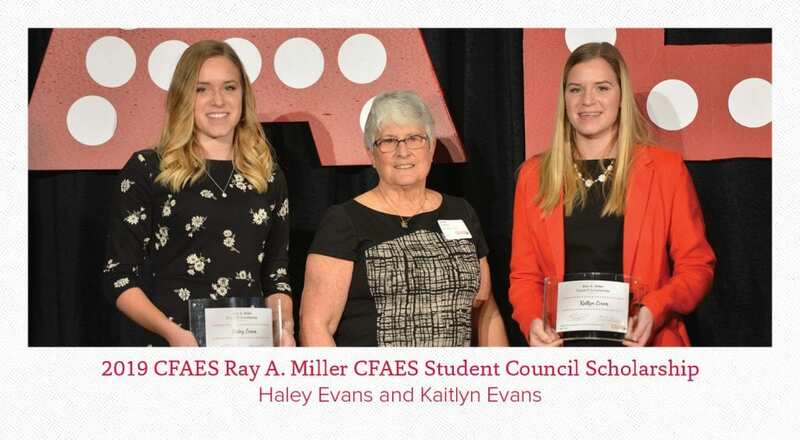 Haley Evans and Kaitlyn Evans, both juniors studying agriscience education, were presented the Ray A. Miller CFAES Student Council Scholarship. 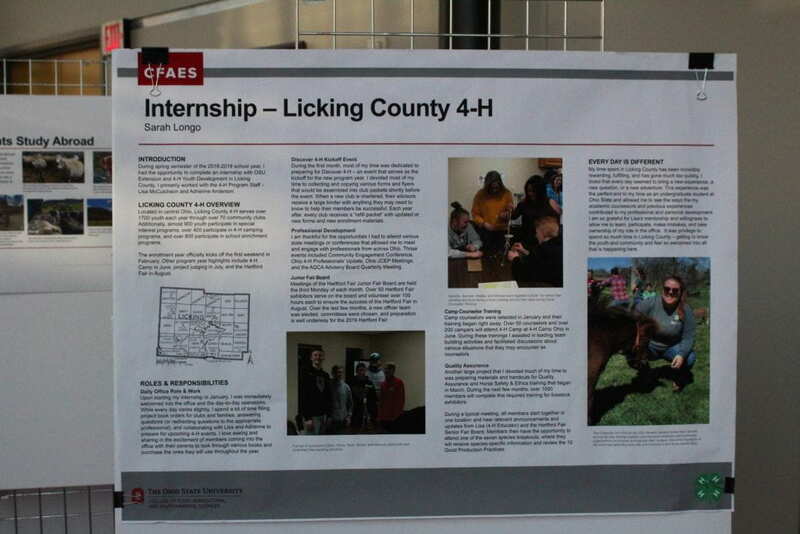 Both students are active members of the Council. 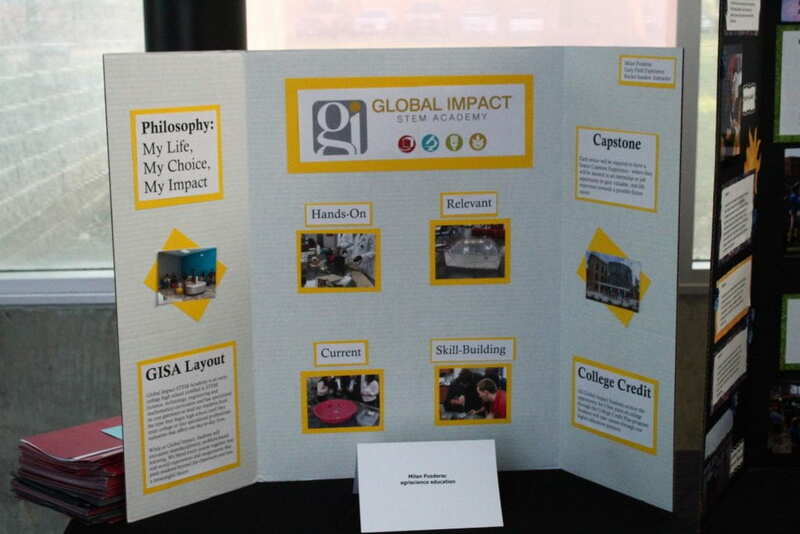 This scholarship is in memory of long-time Council advisor, and former assistant dean, Dr. Ray A. Miller. The Evans sisters are pictured with Miller’s wife, who presented the award. 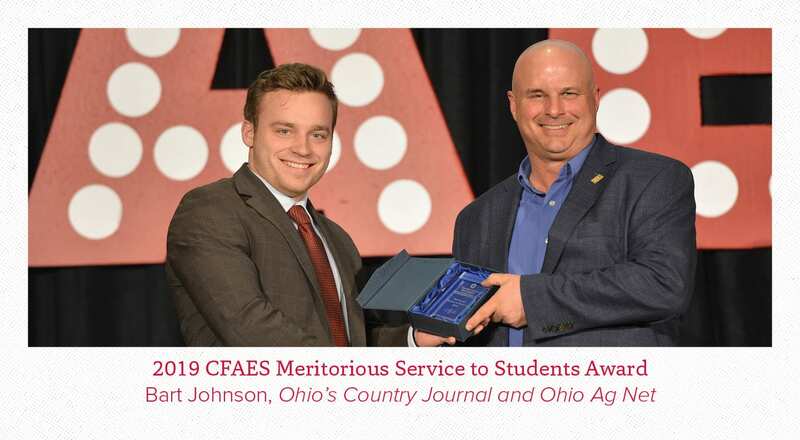 Our department nominated Bart Johnson with the CFAES Meritorious Service to Students Award. 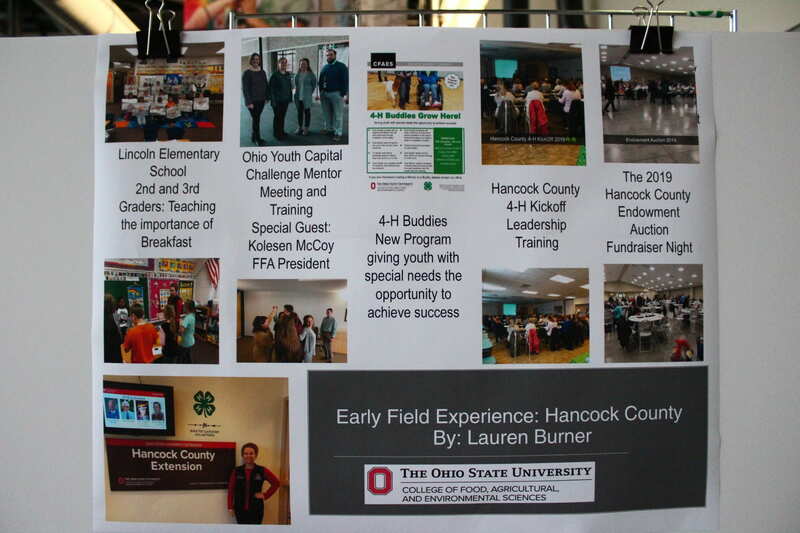 Bart owns Ohio’s Country Journal and Ohio Ag Net Radio and has been instrumental with the success of A Night for Young Professionals, an event hosted by Agricultural Communicators of Tomorrow. 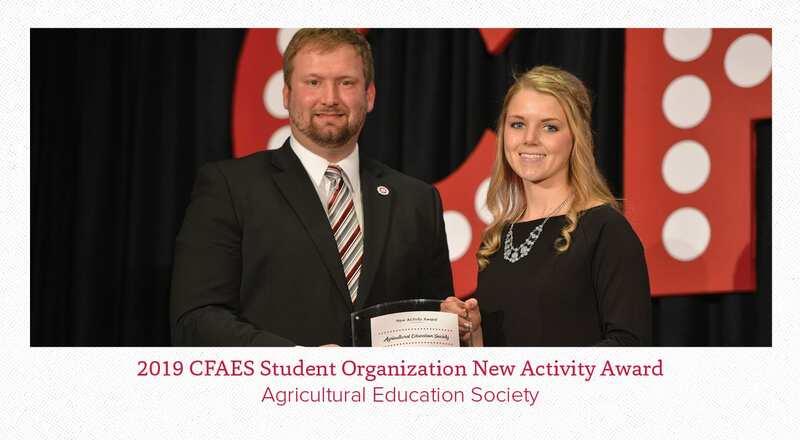 Agricultural Education Society was presented with the New Activity Award. 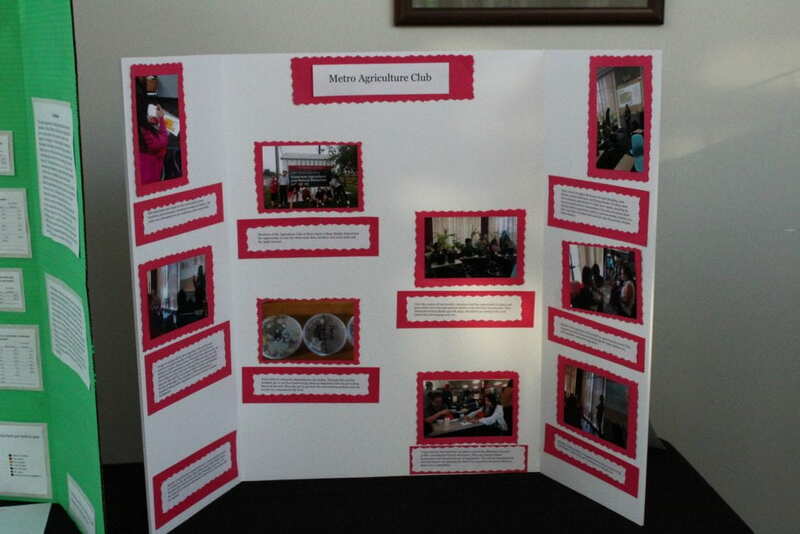 AES has been active in the development and success of an after school agriculture club with Metro Middle School. 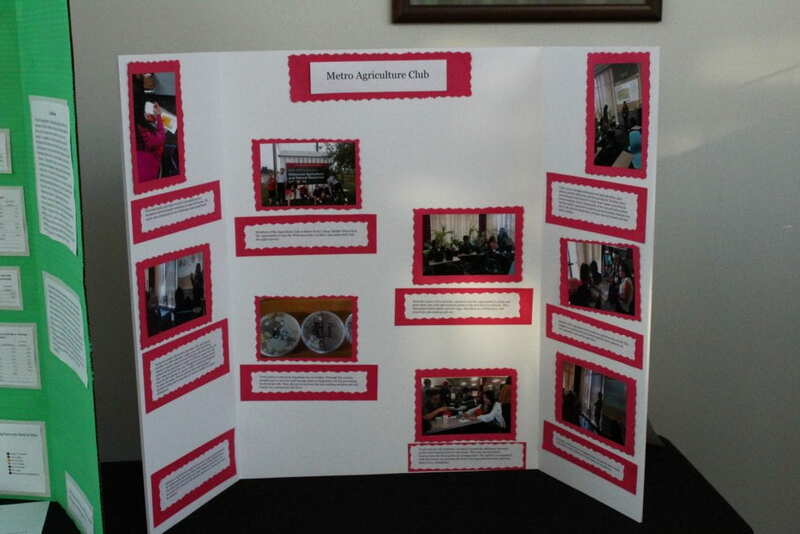 Twice each month, AES members present lessons on agriculture to the students, ranging from the evolution to agriculture, types of soybean plants and tours of the Waterman Dairy Farm. 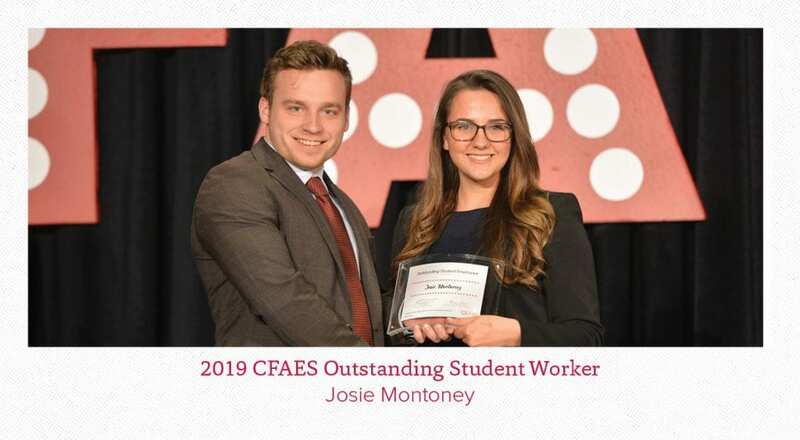 Josie Montoney, a junior studying agricultural communication and public affairs, was awarded the CFAES Outstanding Student Worker Award. 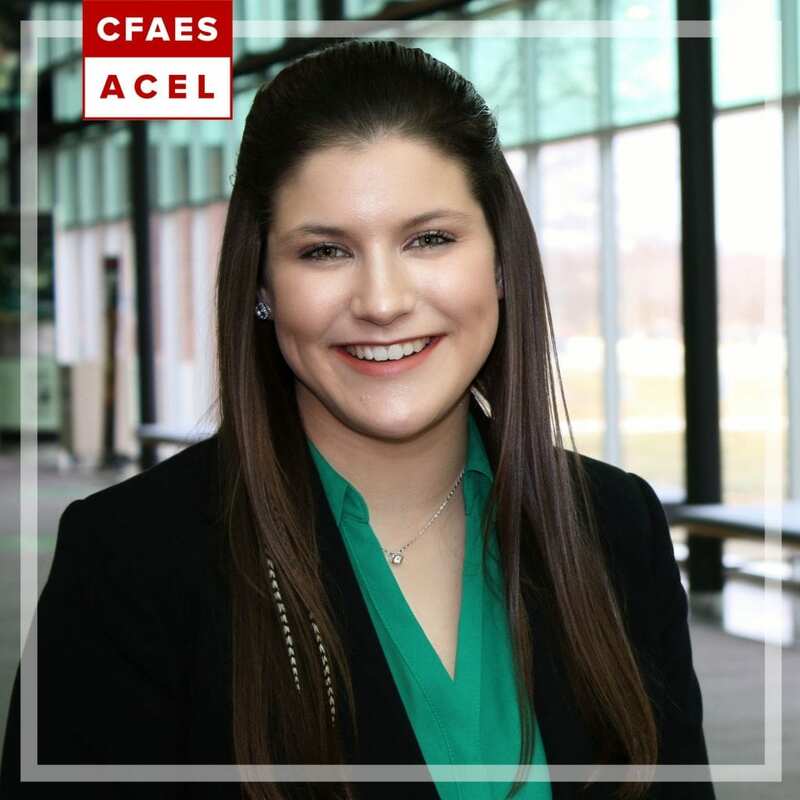 Josie works in the CFAES Office of Government Affairs and was nominated by her supervisor and director Adam Ward. 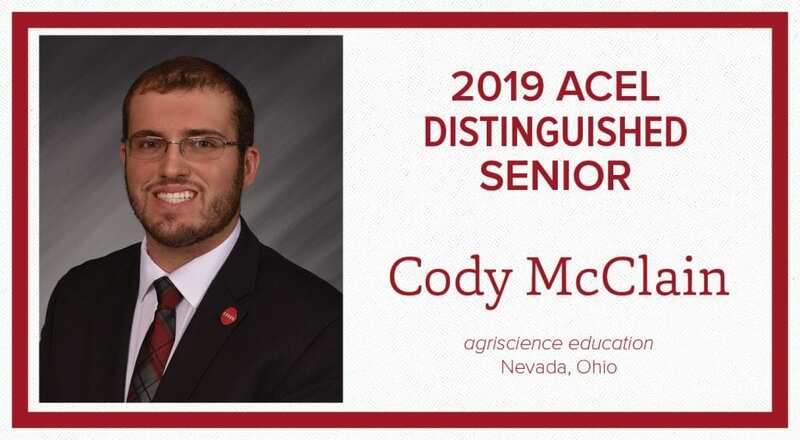 The Department of Agricultural Communication, Education, and Leadership has named 11 students to the first class of ACEL Distinguished Students in 2019. 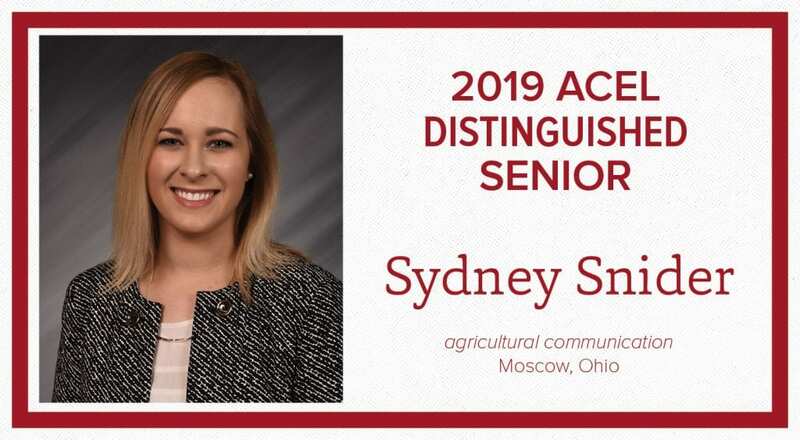 These students were selected by the faculty and staff of the Department for their excellence both in and out of the classroom. 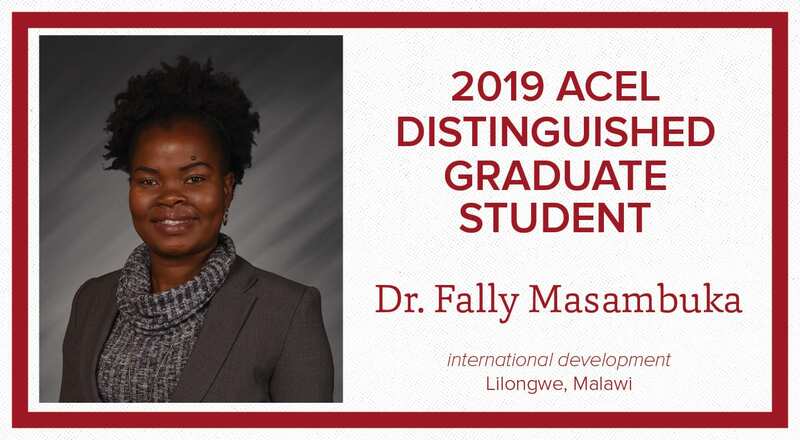 Dr. Fally Masambuka was named the 2019 Distinguished Graduate Student. Masambuka will graduate in May with a doctorate in agricultural and extension education with specialization in international development and agricultural communication. The ACEL Distinguished Students will be recognized at the Department’s annual banquet on April 16, 2019. 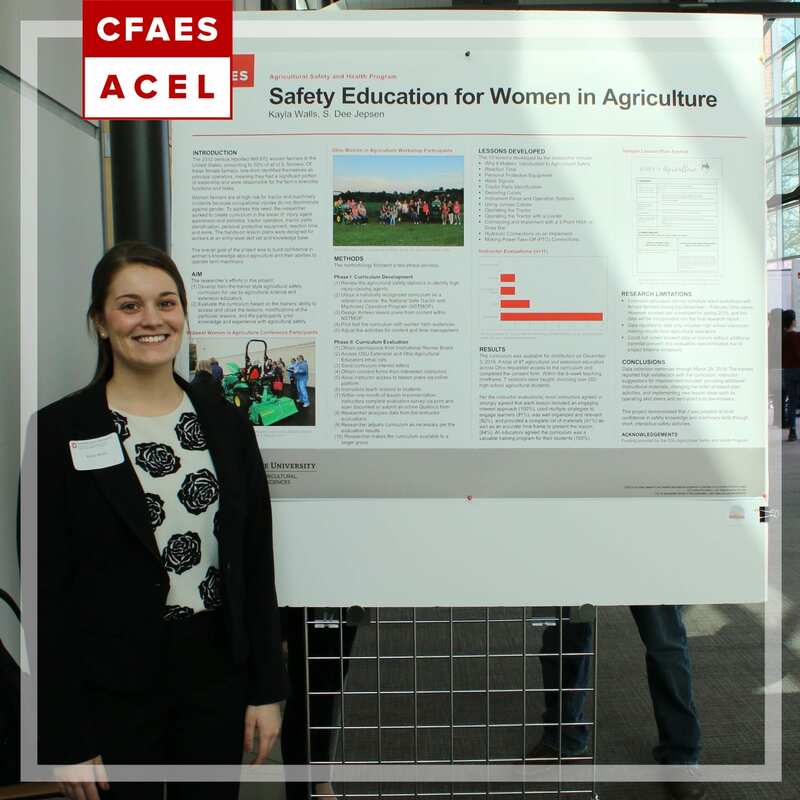 ACEL prepares communicators, educators and leaders in the food, agricultural, and environmental sciences to integrate research-based learning, practice and engagement, in ways that will advance positive changes that strengthen individuals, families and communities. 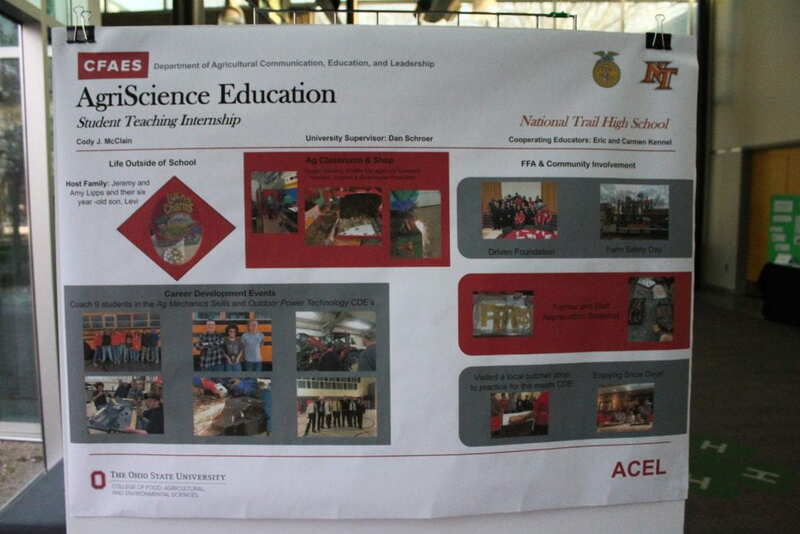 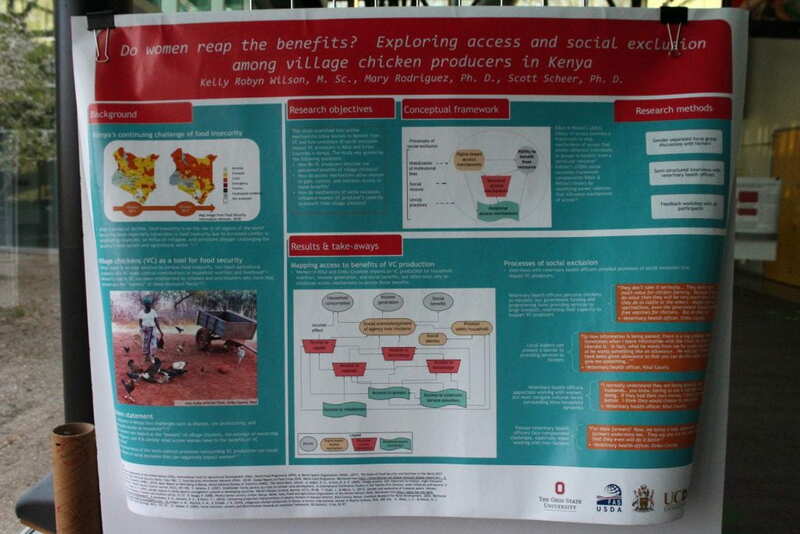 For more information on the academic programs and research available in ACEL, please visit acel.osu.edu. 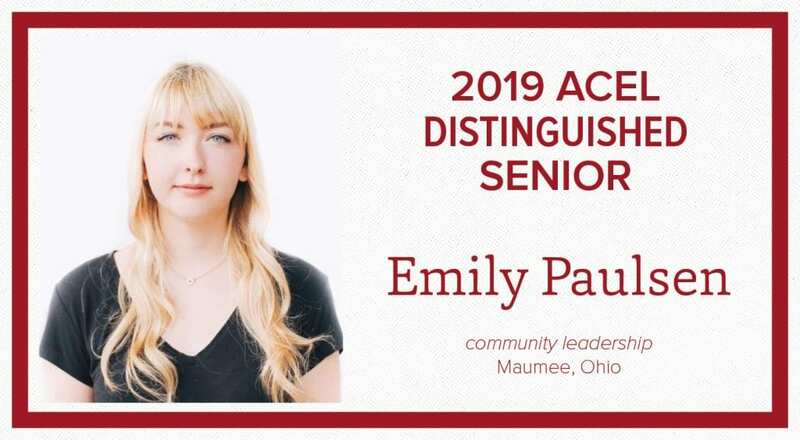 Maddie Allman, a freshman majoring in community leadership, was inducted into the Ohio 4-H Teen Hall of Fame during the annual teen luncheon at the Ohio 4-H Conference on March 2, 2019. 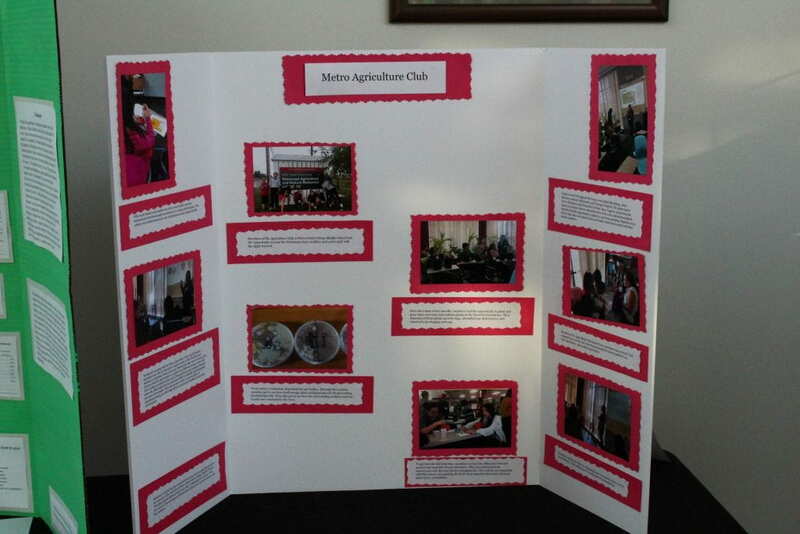 During her more than 10 years as a 4-H member, Allman has developed a passion for youth development and agriculture. 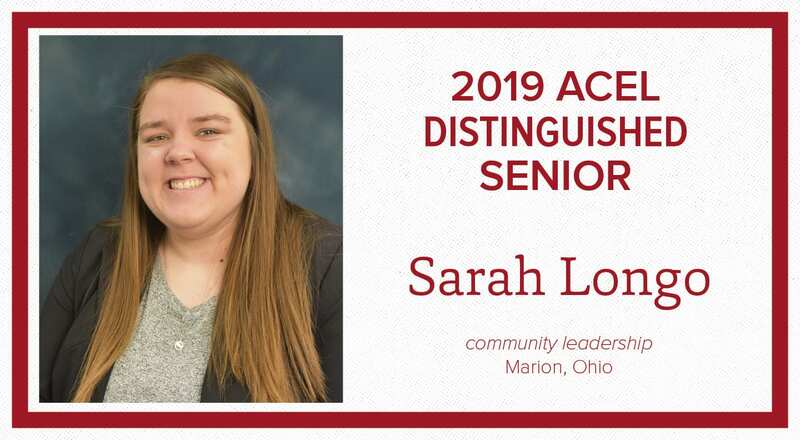 She has served as a camp counselor, Vinton County Junior Fairboard Member, Junior Leader and a member of the Ohio 4-H Teen Leadership Council. 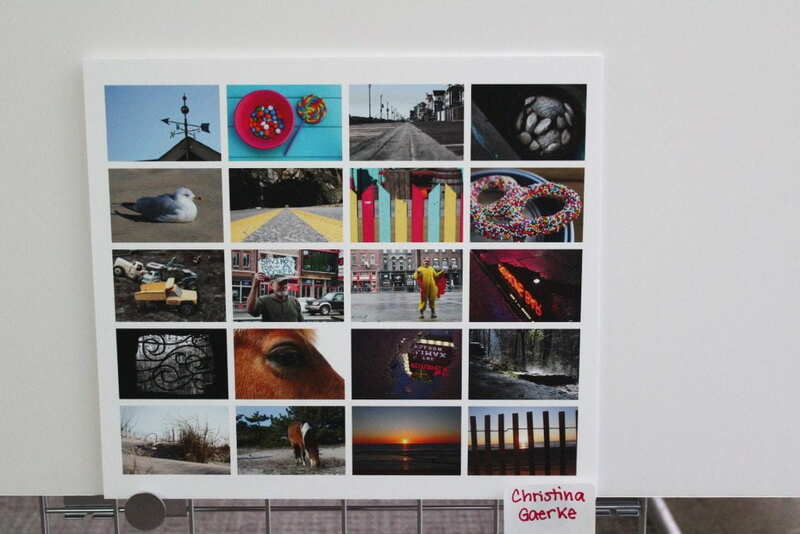 She was named “The 4-H Lady” by her local newspaper for her involvement in the youth development organization. After she completes her bachelor’s degree, where she focuses her studies in community and extension education, Allman plans to become an extension educator. 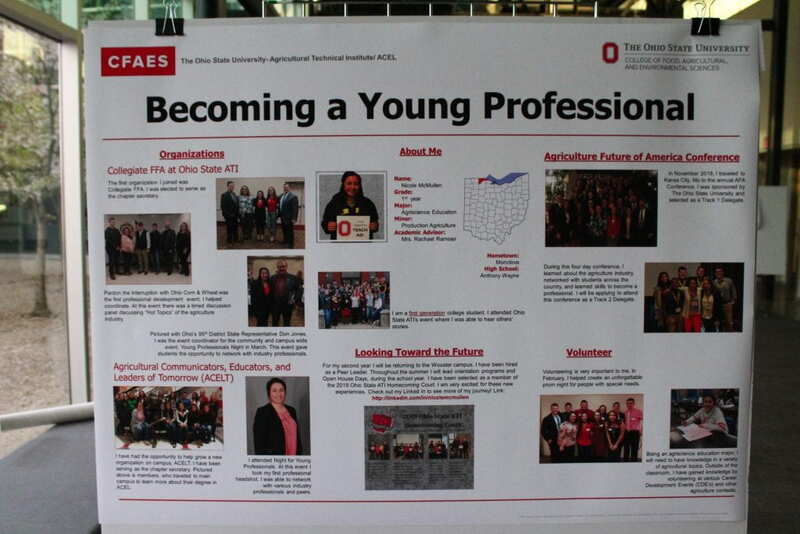 Dr. Annie Specht was recently elected to serve as a senator for Ohio State’s University Senate. 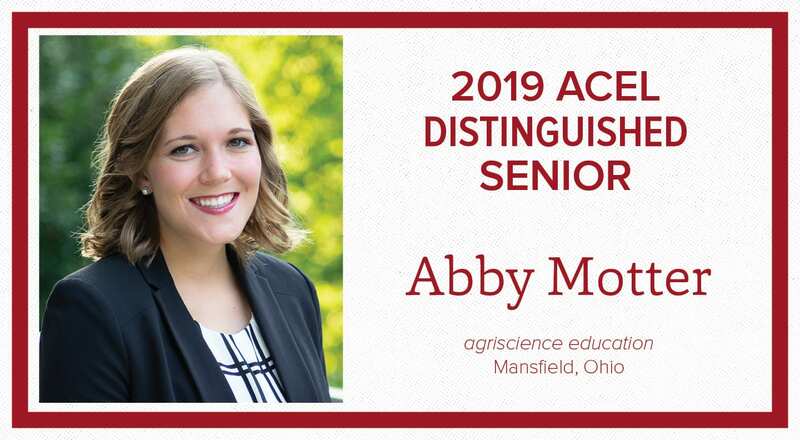 She is an assistant professor of agricultural communication in the Department of Agricultural Communication, Education, and Leadership (ACEL). 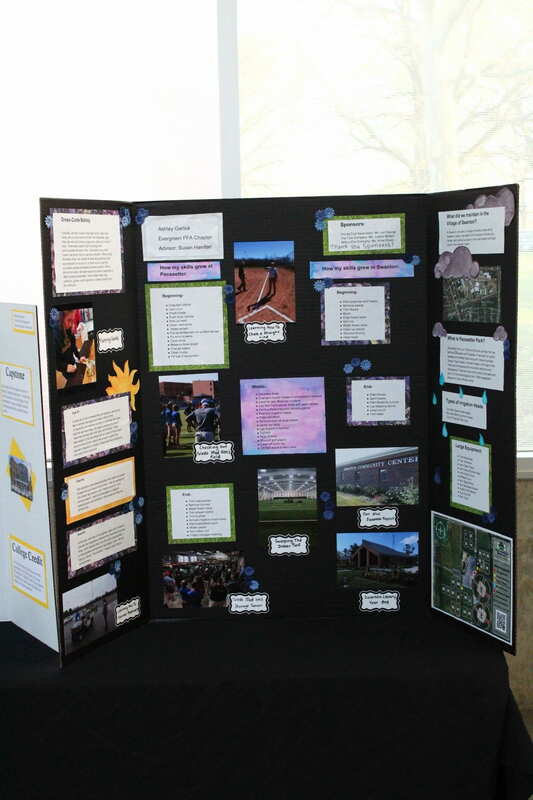 The University Senate is a shared governance body that helps the university function as a unified institution and is made up of faculty members, students and administrators from throughout the University. Faculty senate members are elected from each of Ohio State’s 15 colleges by their peers, with the number of representatives proportional to the size of the college. 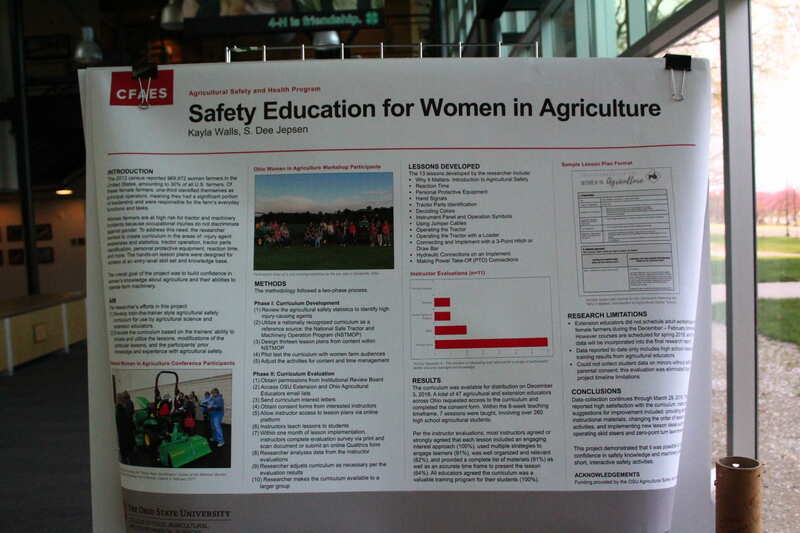 Specht is one of seven faculty members from the College of Food, Agricultural, and Environmental Sciences. 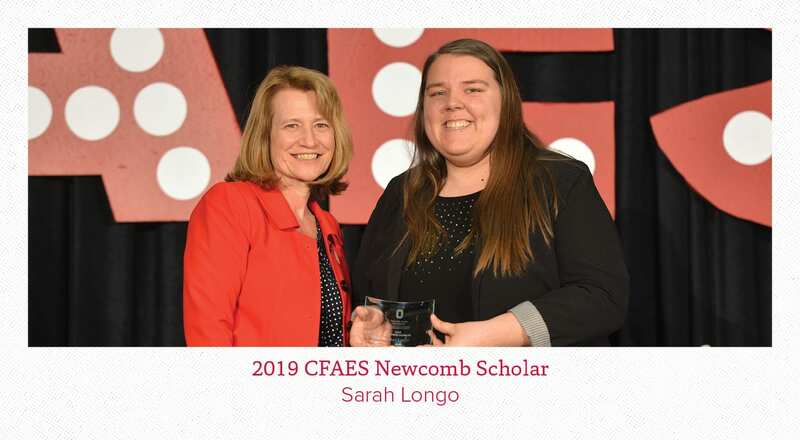 “I’m honored by the opportunity to represent the college, especially as a young female faculty member. 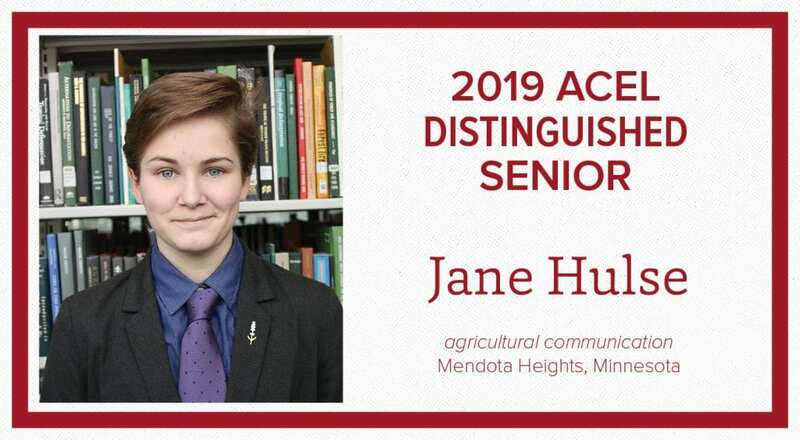 I’ve been looking for ways to get involved in the broader campus community, and I’m excited to learn more about university governance over the next few years,” said Specht. 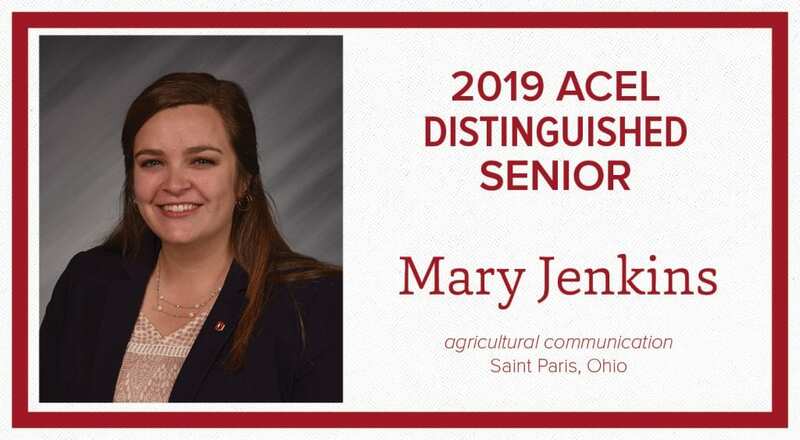 She will serve a three-year term from Autumn Semester 2019 through Spring Semester 2022.Specht is a two-time alum of Ohio State, earning bachelor degrees in English and agricultural communication in 2008 and a master’s degree in agricultural communication in 2010. 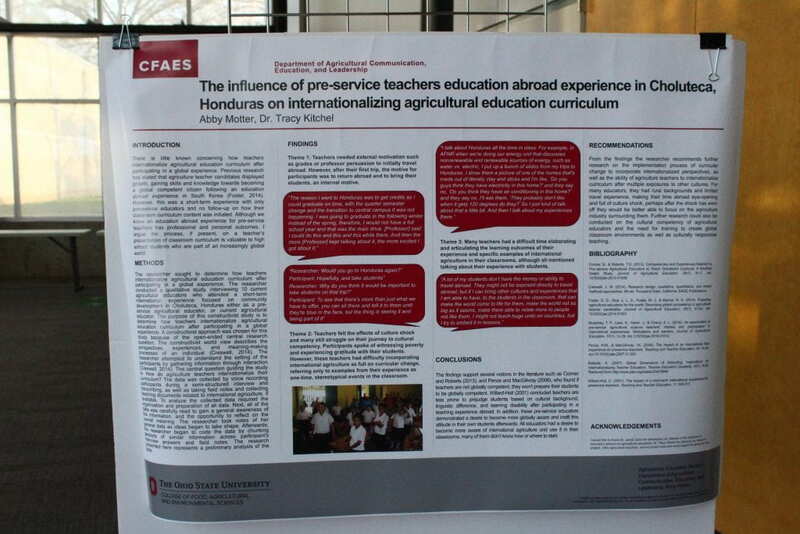 She completed a doctorate in agricultural communication from Texas A&M University in 2013. 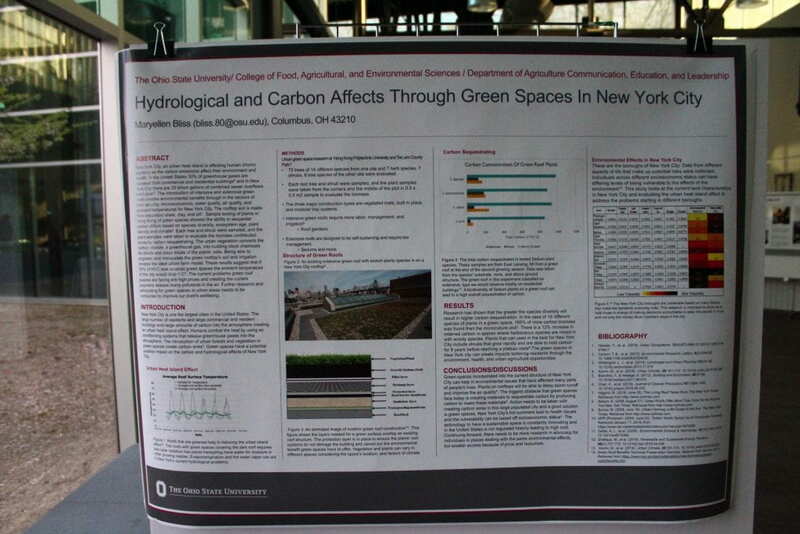 Dr. Emily Buck (second from left) with other LEAD21 participants from The Ohio State University. 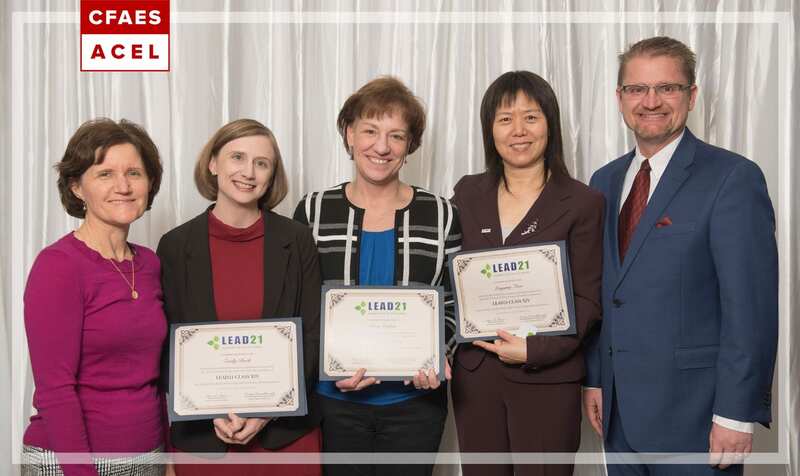 Dr. Emily Buck, of Marion, was one of 79 individuals who completed the LEAD21 leadership development program. 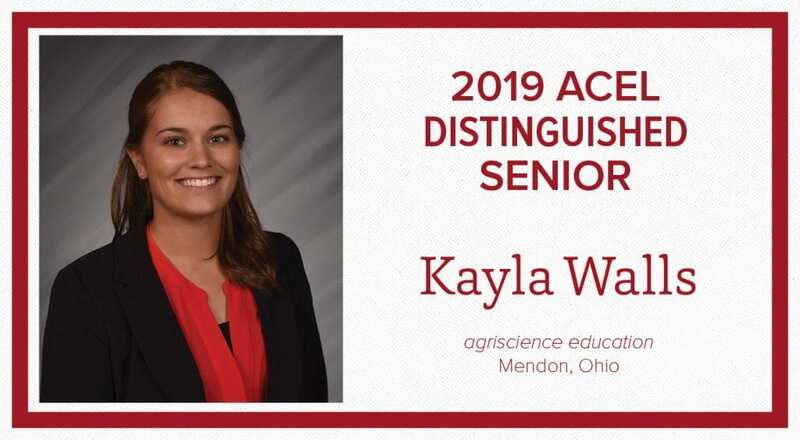 This group of distinguished individuals represents land-grant institutions and their strategic partners from across the nation. 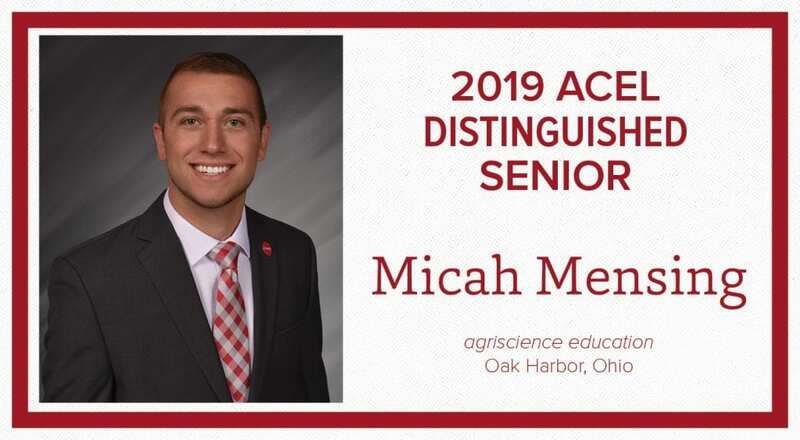 Buck is a professor of agricultural communication at The Ohio State University in the Department of Agricultural Communication, Education, and Leadership (ACEL). 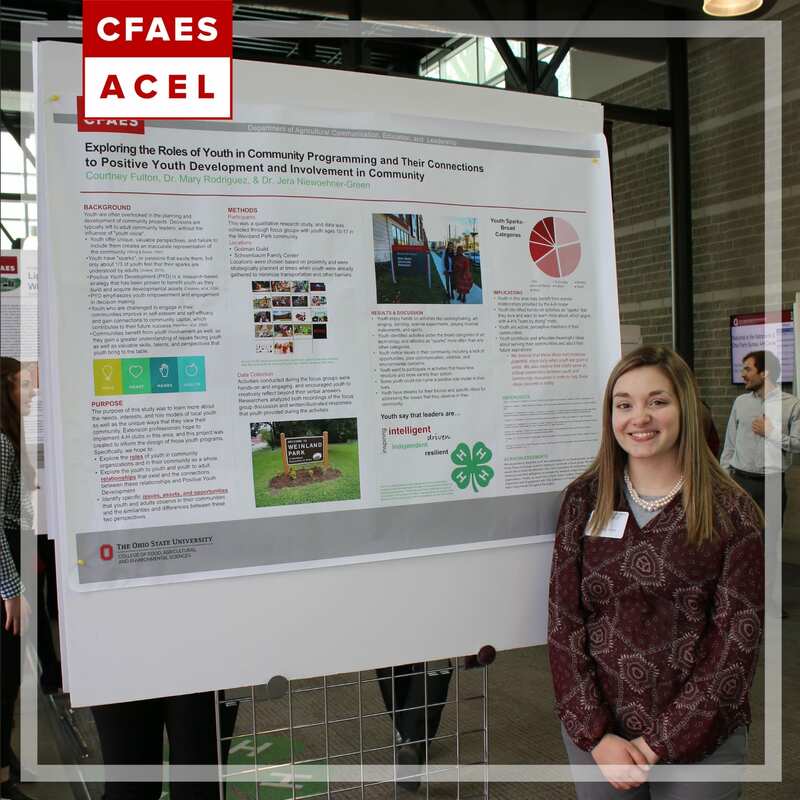 Over the course of the past year, Buck met regularly with her peers, both in-person and virtually, to enhance her personal leadership capacity. 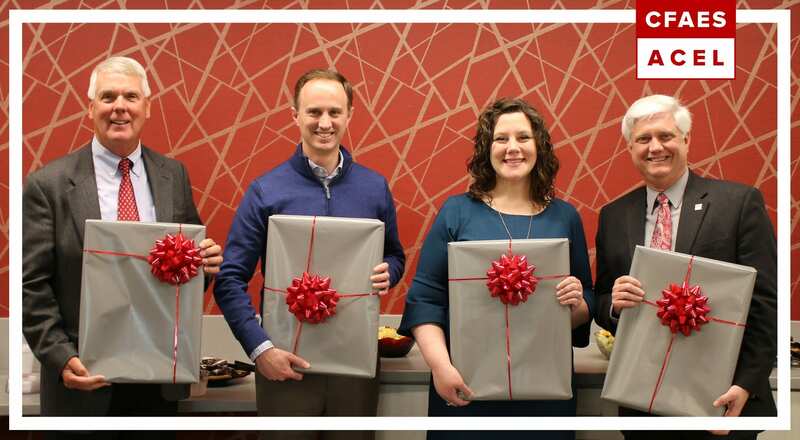 The graduation was held at the culmination of the third in-person session, where the focus was on organizational leadership through collaboration, communication and leading change. 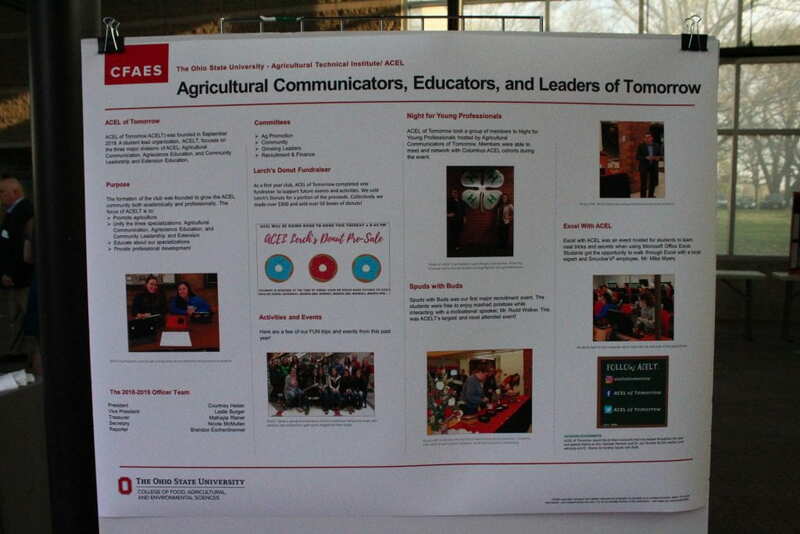 The primary purpose of LEAD21 is to develop leaders in land-grant institutions and their strategic partners who link research, academics and extension who can to lead more effectively in an increasingly complex environment, either in their current positions or future leadership positions. 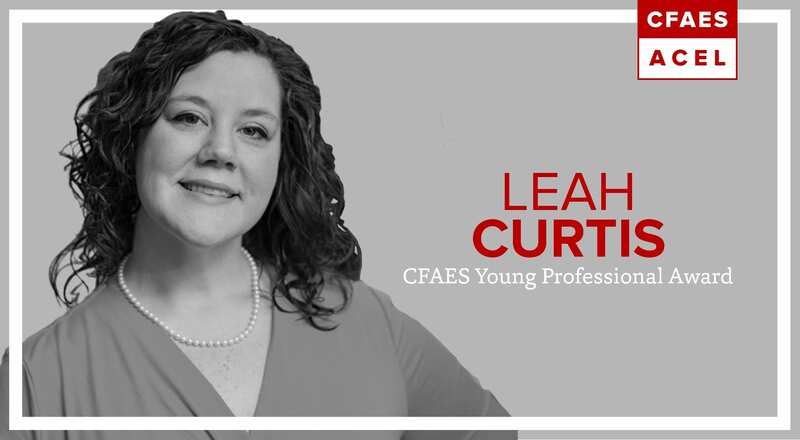 Goals of LEAD21 are to enhance application of skills and knowledge across a set of nine leadership competencies, to develop a network of peer leaders to enhance personal leadership practice, collaboration and diversity of perspective and to develop and implement an individual’s leadership development process. The next LEAD21 class will begin in June 2019. 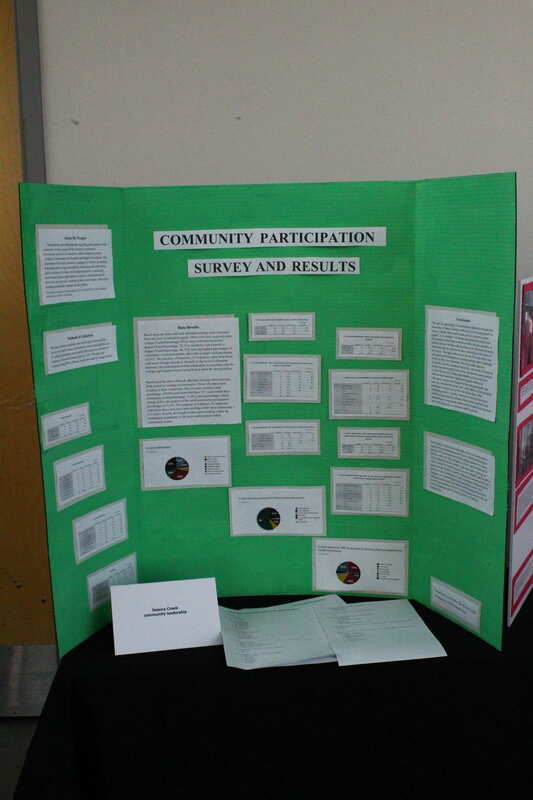 For more information about LEAD21, visit www.lead-21.org. Congratulations to four alumni of the Department of Agricultural Communication, Education, and Leadership at Ohio State. Dr. Bob Birkenholz, Dr. Bryan Garton ’93 PhD, Chris Henney ’98 and Leah Finney Curtis ’07 were selected as recipients of alumni awards presented by the College of Food, Agricultural, and Environmental Sciences (CFAES) Alumni Society. 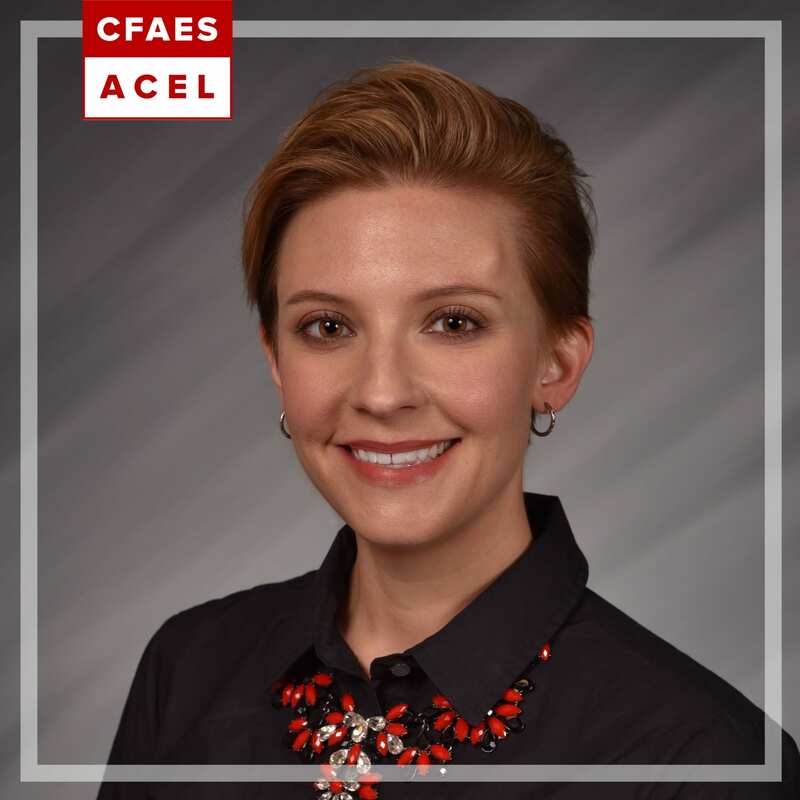 The four alumni were recognized by ACEL at a department reception and will be the guests of honor, along with eight other CFAES alumni selected for awards, at the CFAES Alumni Awards on Saturday, March 2, 2019 at the Fawcett Center.